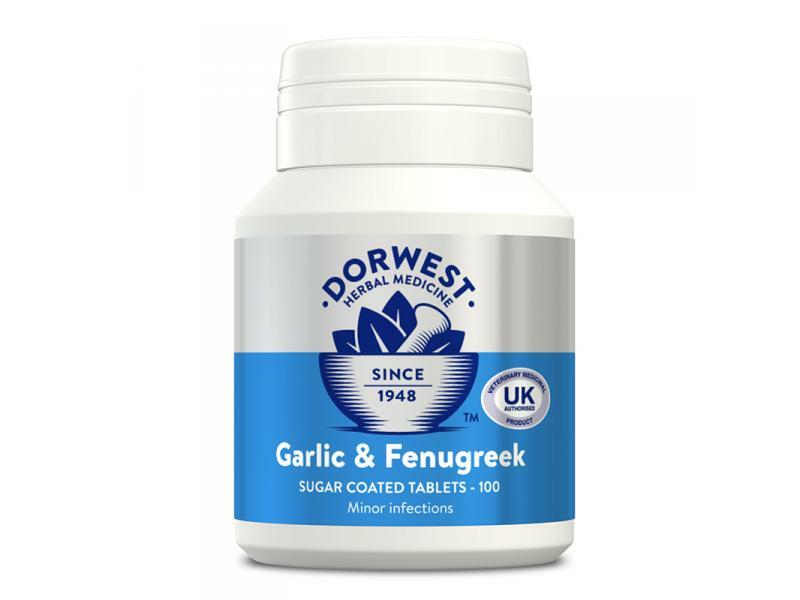 Below are some recent questions we've received regarding Dorwest Garlic & Fenugreek Tablets, including answers from our team. Just want to check that this tablet is safe for all cats? Just I have heard that garlic can be toxic to cats, although i don't know if this is true. My cat has a low immune system at the moment following a tummy bug and is also having some skin problems. Also, are there any side effects to look out for, and can this be used long term?? Many thanks, Karen. It is true that garlic can be toxic to both dogs and cats, but only if given in very large amounts. This sort of herbal supplement is safe to give long-term if you give the usual recommended amounts and I would not expect to see any adverse effects. Hi. I've heard that garlic, and fenugreek can be used for flea prevention, and parasite control. Is there some truth to this? (I'm looking to possibly using these alongside the Advocate, and DRONTAL I use). My dog has recently been suffering with interdigital cysts, had course of antibiotics from vet but 1 recurred. Can you advise if these tablets would help please? Interdigital cysts normally have a particular cause, such as foreign body penetration through the skin. When this happens, there is no option but to treat them as they occur. This herbal product will not do any harm, but will not be able to prevent them occurring again because they are not usually a spontaneous, independent problem. Clipping the hair away from between the pads and checking the area is clean after walks can be the most effective treatment, but you could talk to your vet about this. My dog has suffered from coughs at various times of the year for quite a few years. Each time he has received antibiotics and anti inflammatories from the vet which always clears it up. No reason for the coughs has ever been discovered. Would these tablets help to prevent/ease any coughs he has? Also he is currently taking dorwest milk thistle to aid liver function. Would he still be able to take these tablets alongside this supplement? The Garlic and Fenugreek might well help, but it depends what the underlying cause of the cough is. They can safely be given along with Milk Thistle so it would be safe to give them a try. This might be better than a regular course of antibiotic and anti-inflammatory medication.